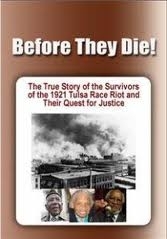 Before they Die focuses on telling the story of the survivors of the 1921 Tusla Race Riot in their quest for justice and to let the world know about their story. The documentary follows the Survivors, and their legal team headed by Professor Charles Ogletree, through the court system all the way to the Supreme Court and on to the US Congress. Before there was 9/11, before there was Oklahoma City, before there was the internment of the Japanese Americans during World Word II, before there was Rosewood (Florida), there was the 1921 Tulsa Race Riot. They are still seeking justice Before They Die.